Last week, on Oct. 19, we entered a new moon phase. To celebrate the occasion, a group from St. Paul’s University’s Aboriginal Education Centre conducted a new moon celebration at the fire-pit of the St. Jerome’s University courtyard. The ritual was led by Kelly Davis of Frantastic Health, an inspiring member of the Haudenausonee community, a Canadian indigenous group. As Davis teaches, it is a blessing to embark upon a new moon each month. According to Davis, with each new moon, there is an opportunity to focus our intentions in a positive way. In this manner, a person is able to manifest positive outcomes in the situations in which they are immersed or involved. Before the ceremony began, Davis offered each of us an opportunity to sage ourselves. Smudging sage is a tradition in many Canadian indigenous cultures, and is practiced by several cultures across the world. Davis also explained that one of the jobs of a fire-keeper is to smudge the air prior to any ceremonies, to eliminate any negative energy which may be present there. During the ceremony Davis took the time to speak on the importance of thankfulness by listing several forces in nature and in the universe that are constantly working to keep us alive, as well as personal gifts which surround us daily. Of these gifts, Davis included family and friends, health and abilities, and the accessibility of opportunities in our community. Tobacco stems were also distributed to hold on to during the ceremony. According to Davis the stems symbolize a connection to nature and the Creator, and are therefore useful in grounding oneself, feeling tethered to these forces, especially while in the process of recognizing blessings and giving thanks. The tobacco is meant to be returned to the earth once you have finished praying on it, whether in water, near a tree, or into a fire. 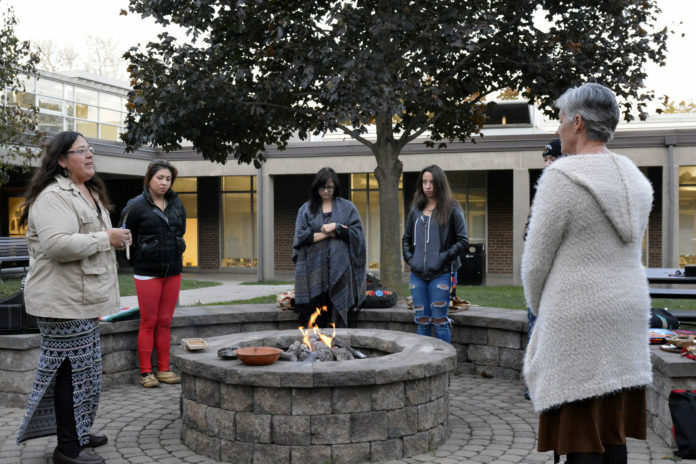 You can learn more about the significance and content of the Iroquois Thanksgiving Prayer in Davis’ recent article, Understanding Prayer From A Haudenausonee Woman, which can be found on her website, frantastichealth.com.